Heart of a Military Woman Book Contributors Announced! After one year as a concept, the Heart of a Military Woman book becomes a reality! It all started when Eldonna Lewis Fernandez met Sheryl Roush, who was autographing her Heart of a Woman books (next to Robert Kiyosaki and Bernadette Peters) at the Book Expo America in Los Angeles, California, last summer. As she personally inscribed Eldonna’s copy, Sheryl mentioned her forthcoming title, Heart of a Woman in Business, suggesting Eldonna contibute. She did, and her story, "Creative Success" was accepted to be published. Later that Autumn, Eldonna suggested a collaboration for the book honoring our active military and veterans. After one year of brainstorming and collecting true short stories, poems and tributes, Heart of a Military Woman went to press yesterday, co-authored by the two women. Click here to order copies of the Heart of a Military Woman book. Sheryl Roush, creator of the Heart Book Series, is a female motivational speaker, specializing in keynotes, conferences, and workplace motivation. For more information, go to Sparkle Presentations, Inc. This entry was posted on Wednesday, November 11th, 2009 at 3:25 am	and is filed under Heart of a Military Woman. You can follow any responses to this entry through the RSS 2.0 feed. You can leave a response, or trackback from your own site. What better timing for this wonderful, inspirational book that honors our military and all those related to someone in the military. We take so much for granted. Freedom isn’t free. As a former senior military officer, I want to say THANK YOU and shake the hands of all Veterans who have served. Veteran’s Day is about Gratitude. We should Never Forget those who have made the Ultimate Sacrifice for our Freedom. How beautiful and timely. Can’t wait to read it in it’s entirety. My heart goes to those and their families who sacrificed so much, so we can be safe and at peace. Bless you Sheryl. I have been refinancing VA mortgages since 2001, from Savannah to San Diego and back again and a few places in between. Our soldiers, their husbands, wives and children are more confident, have more discipline, better relationships and seem to live closer to what is real, more authentic than others. I… have comforted grieving widows, husbands who came home to an empty home and wounded soldiers who won’t heal, physically as well as mentally and emotionally. We do not do enough for these valiant men and women. I am glad you are honoring the fact that most have the courage of their convictions and acted on it to serve and protect our freedoms. It is a privilege to advise them and give them a better financial future. God knows we do not pay them enough. Our military personnel and families need books like these to inspire and provide comfort. Eldonna and Sheryl, thank you for leading this creative effort! Happy Veterans Day! I am so happy and honored to be a part of this book. You are a blessing who continues to uplift and inspire others in a wonderful way. Thanks for bringing all this together! Well Done, Sheryl. I’m honored that you published my prayer. It’s a good thing you and Eldonna have done. I’m proud to be a part of it. I am honored to be included in your book and can’t wait to see all the other inspirational and touching stories. Thank you for creating Heart of A Military Woman it comes at just the right time. Sheryl, I’m so looking forward to reading your book and wish I’d had something to contribute. Well, maybe with your next book. Your book sounds truly inspired, and so meaningful, especially with the state of the country today. Sheryl and Eldonna thank you for providing a way for so many to share our stories. I look forward to receiving and seeing the wonderful book! It is very exciting to launch the stories, etc. into the Universe. I hope that those who receive them find their hearts touched in many ways, from tender to laughter. Thank you for all you do to make this project a success. You are amazing! There is much to be thankful for this year, including this dream and you. I know your Thanksgiving will be blessed by the love you will share. I am grateful for your heart and love… You bless so many others. Happy Thanksgiving to you and your family! This book the Bomb! I’m already reading it! You’re a genius; I need to tap into your knowledge. 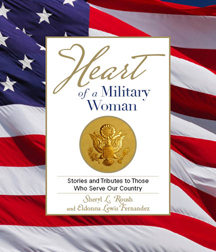 I’m honored to be part of your “Heart of a Military Woman” book and have the opportunity to recognize the women. Casualties of the Vietnam “Operation Babylift” C5-A crash (April 4, 1975). Best wishes for great success with the book! I have scheduled a book signing for Feb 14 in Denver CO….thought “Heart” series book goes well with Valentines Day! Plus it gives me time to plan it. Thank you for including two poems I wrote about the women who served in Vietnam… Thanks Sheryl…I appreciate your efforts in putting this most needed book together for the women who serve our country. Author of the book POEMS IN THE KEYS OF LIFE: Reflections of a combat medic. Thank you for letting me be a part of the Heart Book Series. A wealth of stories, inspiration, poetry, patriotism.